The millions of "Sweet Potato Queens" and "Ya-Ya" sisters speak to a growing hunger to talk about, read about, and ponder the ineffable nature of women's relationships. 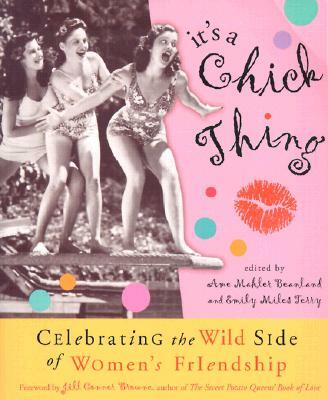 "It's a Chick Thing" is a collection of forty spirited stories about the special and unique times that strengthen the bonds of women's friendships and create shared history. It takes a look at women's friendship at its wildest, adventurous best -- the antics, the escapades, the risk taking, the loyalty, the irrepressible humor and merriment. Read about Dolly Parton's escapades with her friends in high school, Fergie's and Diana's night on the town during Andrew's bachelor party, how Sharon Stone literally gave Mimi Craven the shirt off her back, and the time when Patsy Cline and Loretta Lynn faced down the Coal Miner's Daughter's detractors. Readers will delight in reading about Cirque du Chien, a group of party-loving chicks who dress up like French poodles and drink French champagne. Or La Bella Mafia, a girl gang dedicated to glorious divadom who right wrongs and overdress for every occasion. "It's a Chick Thing" also includes chick resources such as "Shoo Fly Be Gone," a list of verbal comebacks for getting rid of those pesky men who interrupt your girls' nights out and "Chick Stars," an astrological guide to finding your most compatible (and incompatible) friends. There are also handy chickcentric lists including "Chicks That Rock," "Chick Reads," "Chick Flicks," and "Chick Cliques.